The Eastern Newt is a salamander. As an adult and in the larval stage the Eastern Newt is an aquatic amphibian. During its juvenile stage, called the eft, the salamanders are terrestrial. Eastern Newts that lose limbs have the ability to regrow the lost limb. They also have the ability to repair damaged heart muscles. DESCRIPTION: The Eastern Newt is distinctive from other salamanders by a raised crest between their eyes. The adult is olive green to yellowish brown on top and a shade of yellow underneath. They have small dark spots spread all over their bodies. Eastern Newt hatchlings are only ¼ to ½ inch in length. The have smooth bodies and enjoy an aquatic life for 3 to 5 months before transforming into a terrestrial “eft”. The eft is reddish brown in color with two rows of black-bordered red spots. The bright color is an indicator to predators that it is toxic. The eft is twenty times more toxic than during the larval stage or adult stage. During this terrestrial stage the Eastern Newt’s skin is dry and rough like a toad. However, during the Eft stage when the Eastern Newt lives on land it must still keep its skin moist. The eft has a long slender body. Adult Eastern Newts grow to be between 3 and 5 inches. Adults prefer an aquatic environment but they can live on land if their watery habitat dries up. Some adults do choose to live on land if the water supply is low. Adult Eastern Newts have four toes on their front feet and five toes on each back foot. Adults are also strong swimmers and they move fast in water but are slow on land. RANGE: Eastern Newts are one of only a few species of true salamanders native to North America. It is found throughout the eastern United Sates and Canada. HABITAT: Forests with wet marshlands are the ideal place for Eastern Newts. The larvae and adults live in bodies of freshwater that have muddy bottoms. During the eft stage they live in lakeshore and woodland environments. In winter efts hibernate under logs. DIET: Carnivores and Insectivores – they eat mainly small invertebrates like water fleas, worms, snails and beetle larvae. 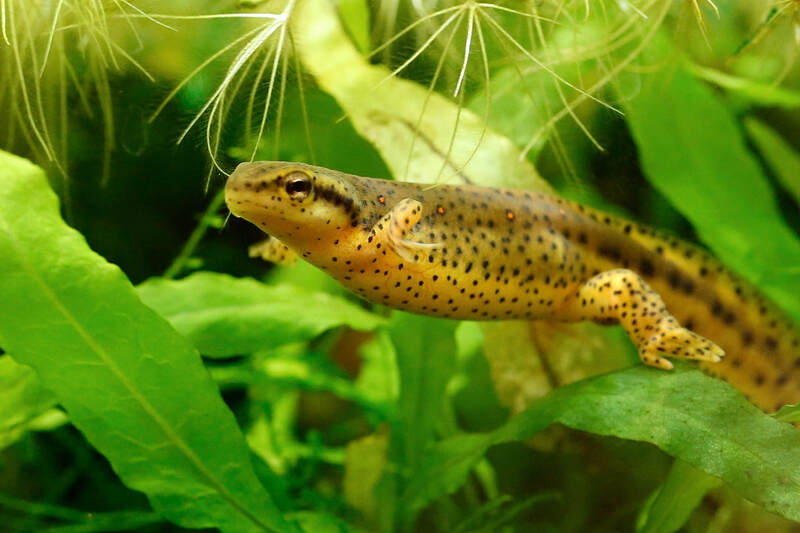 FAMILY LIFE: Eastern Newt females lay between 200 and 400 jelly-covered eggs in single segments on submerged aquatic plants over the course of a few days. Once the eggs are laid they are left on their own. Depending on the water temperature the eggs will hatch in 3 to 8 weeks. Three to five months later, the aquatic larvae will lose their gills, develop sac-like lungs and move onto land as an eft. They remain in that stage for 2 to 3 years before developing a powerful flattened tail and returning to the water as breeding adults. They remain aquatic for the remainder of their lives but can survive on land as well if water is scarce. LIFE SPAN: In the wild the mortality rate is high in the egg and larval stage but the efts and adults have been known to survive an average of 13 years. Eastern Newts in human care have an average life span of 15 years.